The main work of Section one involves observation R&D and information. It is responsible for providing the public and other departments in the museum with necessary information and answers. In terms of observational R&D, successes have been achieved regarding moon and solar observation. Contacts are also maintained with foreign astronomical groups and a sun spot annual report is also published. In terms of information, a yearbook, which contains advance information on the year’s main astronomical events, is published. An astronomical information leaflet is also regularly sent to schools and libraries. The nonscheduled astronomical bulletin also reports on the latest new astronomical knowledge and discoveries in Taiwan, keeping the Public abreast of the latest astronomical developments. 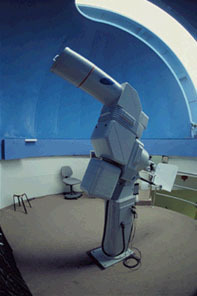 A collection of astronomy books is also maintained which is available to the public for reference and research. The department also rapidly provides the public with information through a bulletin board and the Internet. Of all the departments, this group has the most interaction with the public in its role in education and activity staging, and is best positioned to play the role of “education ambassador”. It offers a wide range of promotional activities and reaches the young, teenagers, teachers and citizens of every class through a variety of channels. It continues with its educational efforts, moving inexorably forward. 1) Astronomical Camps: Every year various types of astronomical camps are held, like the annual youth astronomy camp, the middle school astronomy camp, the primary school teachers’ camp, the middle school teachers’ astronomy camp and the citizens’ astronomy camp. 2) Astronomical activities: A variety of outdoor activities are held, like the heaven and earth tour, the southern cross tour, outdoor star gazing activity, star making activity and a “know the stars and nature activity". 3) Open observation: Regular astronomical observation activities are held, which offer the public a chance to really observe the planets. 4) Special opening: When there is a solar or lunar eclipse, a comet or other special astronomical events, or on special traditional festivals which are astronomy-related, like Chinese Valentine’s Day or at Mid-Autumn Festival, the museum is open, with explanations provided. 5) Special topic lectures: Scholars and experts are invited to offer a variety of astronomy-related lectures. 6) Astronomy displays: Through models and puppets and other teaching materials, astronomical information is displayed with the concept of the universe explained. 7) Teaching materials development: Astronomy teaching materials, teaching cases and teaching method R&D design, manufacturing, publishing and promotion are provided. 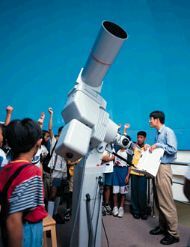 8) Touring education: Telescopes and audio visual equipment are taken on the road to schools and colleges to disseminate astronomical information. If, as it is said, that the role of Section II is moving education, then the role of the exhibition department is inert displays. Its large displays area is a realistic astronomical world, with models displayed and explanations provided by guides. This always excites the interest of every visitor. These carefully designed models are designed to be closely inspected and understood by the public. The aim is for the museum to be like a treasure house of new knowledge from which the public will leave fully laden. 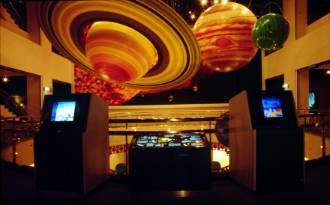 The displays are generally not changed very often, but the special display room and many small theaters will regularly change their displays to show special constellations or stage special theme displays. Advanced audio and video equipment can achieve stunning visual effects, and making good use of such technology to view the astronomical scenes is a treat for audiences. In the IMAX Theater that is run by the department, the stars and space scenes that are displayed on the semi-circular screen take the viewer to the stars. Without doubt this is the most striking educational method. 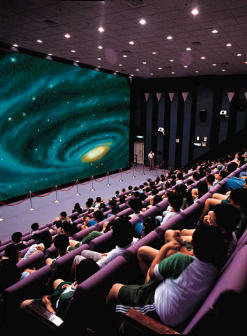 The 3D theater regularly shows astronomy, space and scientific films, and by wearing a pair of 3D glasses the virtual reality 3D images can be viewed by audiences. The effect is of a realism that far exceeds normal film. There are also multimedia shows held periodically which provide the public with science and technology information. Our mission is to teach through enjoyment. Our ultimate objective is to mix science and entertainment in education.